The Pyrenees mountain range divides the Iberian Peninsula from the rest of Europe acting as a natural barrier between Spain and France (French Pyrenees on the north and Spanish Pyrenees on the sunny south-side). Our touring area covers the Spanish side stretching for more than 400 kilometers from the Bay of Biscay to the Mediterranean Sea. On the westernmost end you will find the wonderful and hugely varied province of Navarra with its well-preserved traditions and lovely villages in high mountains and verdant valleys – and even a desert! The ‘Kingdom of Navarre’, as it was once called, is the perfect “appetiser” for the Pyrenean adventure. Further east, the Aragonese Pyrenees are the heart of the Spanish Pyrenees with truly awesome scenery. The stars of the show are undoubtedly the National Parks of the high Pyrenees, from the Valles Occidentales through Ordesa and Monte Perdido National Park to Posets-Maladeta, reaching 3400 metres at Pico de Aneto, the highest peak – but don’t miss the pre-Pyrenean wonders near Loarre and in the stunning Sierra de Guara. On the Mediterranean coast the Catalan Pyrenees rise abruptly to 3000 metres and stay up there all the way through to Andorra providing breathtaking Alpine scenery all the way. Here you will discover the spectacular national parks of Aigüestortes y Estani de Sant Maurici and the regional park of the Pyrenees Catalans as well as the pre-Pyrenean Garrotxa Volcanic Park and Cadi-Moixeró. Wherever you go you’ll find wonderful bird life and high mountain flora set in the most spectacular scenery. Each region is defined by its strong cultural identity and each has its own singular gastronomy, excellent wines and extraordinary heritage, but the mighty mountains make them all feel part of the great Pyrenean family. The Pyrenees are a paradise for all manner of mountain activities from climbing and caving to rafting, horse-riding, canoeing and hiking with good weather from early Spring through to late Autumn (see below). Here you’ll find many large birds of prey, including resident vulture colonies and the lammergeier or bearded vulture, one of Europe’s largest and rarest, as well as wall creepres, alpine choughs and a host of migratory birds, funnelled through the valleys on their journeys north and south, making the range a a mecca for bird-watchers and a pleasure for all. For culture-vultures there is much to marvel at with an immense heritage of Romanesque art and architecture as well as vestiges of Roman and Arabic presence in the region and wine lovers will find plenty to savour from Navarran varietals through the wonderful wines of Somontano to the delicious volcanic wines of La Garrotxa. The Pyrenees mountain range is not only a geographical border between the Iberian Peninsula and the rest of Europe, it also acts as a climatic frontier between the Atlantic and the Mediterranean. In the Navarran Pyrenees as the mountains tumble down to the Atlantic Ocean the climate is more humid with heavier snowfalls in winter. 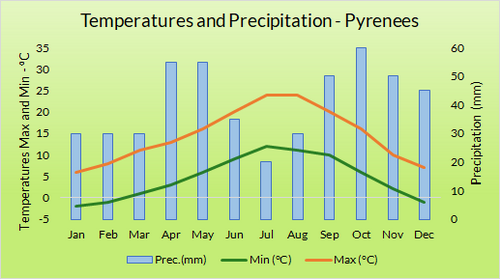 Temperatures, whilst usually quite mild, vary from north to south or even during the day. It can be hot in the morning and really quite cold by night! The best time season is from March to October but whatever the time of year come prepared for everything! Further east, as you approach the Mediterranean coast, precipitations are more scarce, summers are hot and dry and winters quite cold. It is however difficult to generalise regarding the seasonal climate in the Pyrenees as conditions vary depending on the latitude and longitude and also on the altitude. For example, in the lush green northern Valleys of Ansó and Hecho rainfall is somewhat heavier than nearby Jaca or Ainsa. In the central and eastern Pyrenees, April and May, when the rivers are swollen after snow-melt, conditions are perfect for water sports such as rafting, kayaking, river boarding and canyoning. 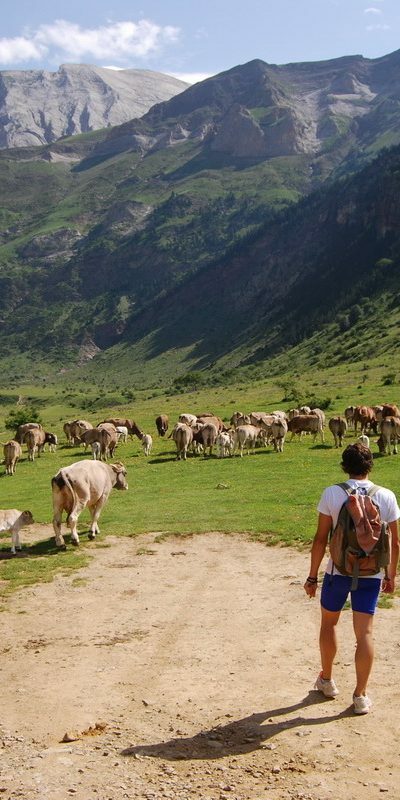 June to mid-September are the driest and sunniest months, best time for hiking in the mountains, for horse trekking, rock climbing and road and mountain biking though in high summer you must come prepared for some really high temperatures. And of course, if you are a winter-sports lover, December through to February is your ideal time to come. Brittany Ferries offer seven sailings a week from Portsmouth or Plymouth to Santander or Bilbao. Crossings are over-night and take between 21 and 24 hours (with the exception of the Sunday night crossing which takes two nights). Bilbao is the closest to the mountains but Santander is only an hour further west. There are also direct flights to Biarritz, Tarbes & Perpignan on the French side – please note that hire cars can cross the border but must be returned to their country of origin. Roads are constantly improving with ongoing improvements to the A-21 / N-240/260, linking from Pamplona in the west across to Girona and the Mediterranean, making it much easier to traverse across the mountain range. If travelling by air we usually include a hire car whilst those coming on the ferry will use their own vehicle. In either case we will provide full driving instructions, GPS co-ords for the accommodation and essential information on driving in Spain as well as a touring map of the area. Surrounded by some of Europe’s finest culinary regions – south west France, the Basque Country & the Rioja wine region – and with surprisingly varied terrains, Navarran cuisine has plenty to offer. The Mediterranean climate of southern Navarra, watered by the Ebro, offers Spain’s finest premium vegetables (peppers, asparagus, artichokes, etc) whilst the wineries, unlike most other regions in Spain, are not limited to any particular grape variety and so produce a wide range of interesting wines. Northern Navarra is particularly known for the quality of its cattle and dairy produce as well as some prize-winning sheep’s milk cheeses. It’s also renowned for its game, wild mushrooms and trout from the mountains. Don´t miss a good trucha a la Navarra (baked trout with serrano ham), especially in season, a menestra de verduras (a mixed vegetable stew with artichokes etc) or perhaps try the local peppers stuffed with various fillings often salt cod (pimientos de piquillo rellenos). Prices are usually very reasonable and portions generous! Mountainous Aragon, at the heart of the range, is known for its robust, hearty fare – perfect after a bracing hike, a day’s birdwatching or a session of white water rafting. These days though a certain finesse can also be found and local chefs are learning to emphasise the top-class local ingredients such as mountain reared livestock and cured meats accompanied by their interesting Somontano, Cariñena or Campo de Borja wines. At the eastern end of the Pyrenees the Catalan cuisine (Cuina Catalana) is a mixture of both the mountain fare with its delicious stews, bean dishes, local cheeses, pates and sausages and the strongly present Mediterranean influence. The Volcanic cuisine of the Garrotxa region has its own special twist, with all the ingredients (including delicious local wines) being grown in Volcanic soil. In the Vall d’Aneu look out for the local caviar from sturgeon reared in the lake!